The contract is signed. The commission is a reality. Now I have to sculpt the 7ft 5in sculpture of Sir Nigel Gresley in clay. Gulp. My permanent studio is far too small and is on the first floor. The ceiling needs to be high. There needs to be sufficient space so I can stand back and view the sculpture properly. It needs decent light. It has to be secure with 24-hour access. It can’t get too hot, or the clay will dry. It needs to be within a 45 minute drive from home. And of course, not too expensive. I don’t want much! My intensive searching reveals little that meets my criteria. But I am convinced I will find something. And I was right. It takes 5 weeks but I find the perfect temporary studio, thanks to a tip-off from a sculptor colleague. 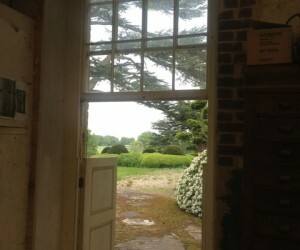 This airy early 19th century building nestles in the heart of the countryside, with gorgeous views from the door. 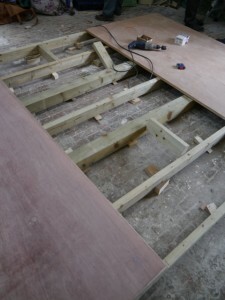 Family and friends are drafted in to build a flat wooden platform over the very uneven cobbled bricks. A flat surface is essential for manoeuvring the trolley on which I will be sculpting the clay figure. At one point we have four drills at work, screwing the plywood onto the wooden frame. The next step is to get new daylight strip lights installed, to improve the light for sculpting, and install additional electrical sockets. And we’re off! Ready to start building the armature for the Sir Nigel Gresley sculpture.